Government officials and local Karen National Union officials have decided to let villagers decide if a cement factory is to be built in their area. Following strong opposition by the villagers against the proposed cement factory planned for the Mi Kayin village area, Hpa-an, Karen State, the KNU and government officials told a public meeting that it was now up to the villagers. During the public meeting held on April 28, between Karen State officials, local KNU officials, company representatives and local villagers, the KNU officials from Thaton district said that only residents can give the go ahead for the cement factory. The proposal to build a cement factory at Kawt Phyan Mountain near Mi Kayin village was proposed by the Myanmar Ji Dong Cement Co. Ltd early this year. Padoh Saw Kyaw Myint, the KNU liaison officer for the Thaton District spoke to Karen News about the proposed factory. 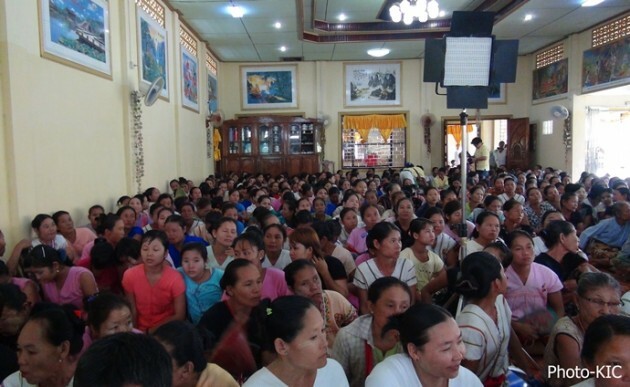 The public meeting held at the Mi Kayin village monastery’s community hall was attended by more than 1,000 people, including Karen State Ministers, Saw Khin Maung Myint from Minister of Road and Communication, U Saw Sar Lawla from Ministry of Forestry and Mining and Saw Kyi Lin from Ministry of Electric Power and Industry, Padoh Saw Kyaw Myint Liaison officer KNU Thaton district, Major Saw Ei Tha, district organizing officer, Padoh Saw Nu Yin, chairperson of Hpa-An township, U Sai Myo Win, Managing Director of Myanmar Ji Dong Cement Co. Ltd and local residents. According to KNU sources, the company said they would provide education, healthcare, job opportunities, water, electricity, road and bridge constructions, if the project were allowed to go ahead. Nan Mu Mu, a local resident who also attended the meeting said. U Sai Myo Win, Managing Director of the company said during the meeting that the residents do not believe in the company and opposed the proposal even though his company presented a photo slide show of the proposed building of the cement factory using modern techniques to maximize the environment protection. Saw Khin Maung Myint, the Karen State Minister of Road and Communication addressed the public meeting and said that the Karen ministers attended the meeting to learn about the position of the villagers. Saw Khin Maung Myint said the state government would not do any business if it went against what the villagers wanted. Residents prepared their opposition to the proposal to build the cement factory and took it to the KNU and the company before public meeting. The villagers were motivated to lodge their protest after learning that the KNU Brigade 1 had released a letter in January 2014 recommending that the Myanmar Ji Dong Cement Co. Ltd construct a new cement factory near Mi Kayin village.